The next round of elections for the government of the Confederation of Democratic Sims (CDS) are almost upon us: the polls open on July 12th. Between my adventures in OpenSim and my ongoing discussions with Prokofy Neva, I've left CDS somewhat in the background. Yet only a few posts back I announced that I was forming a new political party within CDS. Whatever happened to that? Basically, it fizzled. I spent a few months scouting around in the various progressive communities on Second Life, trying to find recruits for a new party in CDS. I met a number of interesting residents, but they were all too busy developing their own projects. And I realized that I myself was branching out in too many directions at once. So I've decided to return into the fold of the Citizen's Social Democratic Faction (CSDF), which is the existing "moderate-left" party within CDS. 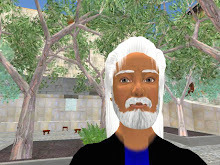 The Confederation of Democratic Sims was the first democratically-run region in Second Life. I've given a brief history of CDS in one of my blog posts, from its founding by Ulrika Zugzwang, to the latter's abrupt departure. In another post I went over that history in somewhat more detail, including a look at the involvement of Ashcroft Burnham, who left to create the Metaverse Republic group. I myself found CDS in the first week after I joined Second Life. I immediately took up residence in Colonia Nova, which is one of the three (soon to be four) sims making up CDS. I was thus on hand for the Representative Assembly elections held in January of 2008, and for the first meeting of the new Representative Assembly held on February 3rd, which is described here. The Representative Assembly of the first half of 2008 turned out to be catastrophic. CDS has had turbulent politics throughout its short history, but this semester has been one of the high-water marks. Following the departure of Michel Manen, who left to concentrate on yet another experiment in in-world democracy, called Al-Andalus, his party CARE was transformed into NuCare, under the leadership of sulphurous ThePrincess Parisi. The subsequent conflicts are told in my blog post Swept Away. In protest over the continual personal attacks which ThePrincess directed at Patroklus Murakami, the elected Leader of the Representative Assembly, the two CSDF representatives resigned from their posts. This provoked a mid-term by-election to replace them. It was in this context that I decided to create a new leftist party within CDS. I announced my intentions in a post on the CDS blog, dated April 10, 2008. My reasons were multiple, but one main concern was that I had been expressing opinions on the forum without seeking the approval of the party I belonged to. The Citizen's Social Democratic Faction (CSDF) proudly announces itself as "moderate left," whereas I've always been something of a radical, and felt the need to have a free hand. I envisaged creating a broad coalition to try to pull together all those who feel in some way or another to the left of CSDF, but I recognize that this is like trying to square the circle, since minor leftist tendencies usually put most of their energy into fighting each other. Meanwhile, the special mid-term elections to replace the two CSDF representatives were getting under way. CSDF decided to present candidates for the two seats that they themselves had given up. The CSDF candidates were Gwyneth Llewelyn and Justice Soothsaker, two long-time stalwarts of the Confederation of Democratic Sims. When the election results were announced on Sunday April 27th, the two new representatives were found to be Gwyneth Llewelyn of CSDF and Flyingroc Chung of the Democratic Pragmatist Union. At the following meeting of the Representative Assembly, the role of Leader of the Representative Assembly (LRA) was again given to Jamie Palisades, who vigorously helped the still-warring factions to focus on issues instead of personal disputes. The NuCare faction, led by ThePrincess Parisi and MT Lundquist, continued to criticise CSDF, in particular for a supposed conflict of interest of their candidates, who had been members of the Scientific Council (a body with authority to judge electoral matters) before standing for election. These criticisms were supported by Beathan Vale, a Representative of the Simplicity Party, who sometimes allied with NuCare, and sometimes took his own track. Numerous new laws were proposed, such as one designed to forestall the aforesaid conflicts of interest, as well as others that implied constitutional changes. In this general ferment, one law was passed which directly affected my project. It was decided that a faction must have a membership of at least 10% of the CDS population in order to present candidates in the elections. Since the population of eligible CDS landowners is something like 80 souls, this means that a party needs at least 8 members to present candidates. Someone has suggested to me in private that NuCare pushed this law through in order to prevent me from forming a new party, but that rumour would give my small efforts unreasonable importance. At any rate, this measure later backfired on NuCare, since their membership has dropped to a level that may make it difficult for THEM to be eligible to present candidates. Another major focus of activity in CDS has been the preparation of a fourth sim. The CDS New Guild, under the tireless leadership of Moon Adamant, updated the CDS Master Plan and finalized the plans for a new sim, to be called Locus Amoenus, which means "Agreeable Place." (I still say it sounds like "Locust Amoebas"). Originally it was ThePrincess who pushed hard for a new sim with small low-rent plots, apparently so that she could easily recruit new members for NuCare, but this also fit in nicely with my plans, because it would make it easier for me to recruit members for my new party. But I was failing to get anywhere. I managed to organise one real meeting, held in the Colonia Praetorium on a Sunday in late May, with a few potentially interested Second Life residents. But a week later the participation was already dwindling. A candidate in whom I had high hopes balked upon learning that one has to buy property in CDS in order to be able to vote, saying: "Property possesses you. I do only squatting. Peace to the hutz, fire to the palace." Another candidate who WAS interested in buying one of my two properties (I was ready to sell my own workshop since nothing else was available), failed to show up on the appointed day. According to CDS law, a new member must buy land 30 days or more before the elections open, in order to be eligible to vote. Since the polls open on July 12th, the transaction had to happen before June 12th. That date came and went, without my having recruited a single new person. So I drew the inevitable conclusions, and humbly went back to being a member of CSDF. But other parties are also having membership problems. Following an obscure dispute about a bath house or hot tub (depending on who tells the story), which may or may not have violated the Colonia Nova zoning regulations, NuCare ejected Cindy Ecksol, one of its own Representatives. Then as the elections approached, NuCare leader ThePrincess considered joining the Democratic Pragmatist Union, perhaps as a hedge against NuCare falling short of the number of members required for presenting candidates. In reaction, other NuCare members led by Bromo Ivory and Mizou Vavoom decided to eject the Princess from NuCare. Behind her façade of pomp and fury, ThePrincess is actually a comic character. She reminds me of the Baron Charlus in Proust, who seems imposing and terrible, but who turns out to be a sort of running joke. Still, while you are all smiling at her antics, remember anyhow to get out the vote. Blimey Danton - that was a great read but really did come across as insanity. All that in-fighting, all that drama. Who is in charge of the whole CDS? Who makes things happen? There must be someone because if everyone is joining and leaving and starting and closing groups, no one would get anything done. Who owns the sims? Who collects the rent? To tell the truth, HeadBurro, after more than six months in CDS I still have trouble understanding how it works. It seems that the sims are owned by one particular alt, since Linden Lab requires a single owner, but I think that alt can be run by different people. The rent is collected by another member acting as Treasurer. But there is no real-life organisation standing behind any of this. As with any group, there is a difference between who makes things happen, who has visible power, and who has occult power. Those who make things happen are residents who volunteer. Some of the most active have neither visible nor occult power, but just roll up their sleeves and pitch in. The visible power is in the government bodies. These include the Representative Assembly (RA), which is elected by the citizens, the Executive Branch run by the Chancellor (who is elected by the RA), and the Scientific Council, which primarily performs judiciary review of legislation when necessary (the equivalent of a Supreme Court). The occult power is exercised in terms of prestige and influence. There is an "inner core" of long-time members who have participated in CDS for years and who know each other well. Some of them go inactive for long periods and then suddenly revive to pick up again where they left off. Because of their connections and knowledge, members of the "inner core" probably exercise more real power in the long run than the members of the government bodies, who only occupy specific functions on a temporary basis (the RA elections are held twice a year).